Leaving the marina, turn to the south end of Pašman and sail with the afternoon maestral between the islands of Arta and Vrgada into the Murter Sea. The goal of the first day is to reach the island of Kaprije (17 Nm). If you feel like having a short swim on the way, you can anchor on the west side of Murter, in the bay of Slanica or at the Koširina camp. An even better option is to make a stop in the Remetić bay on the north side of Kaprije. The village of Kaprije lying just a few miles to the south is an excellent spot to moor for the night. Kaprije is a pleasant fishing village unjustly skipped over by most navigators. Although it has no more than a few hundred inhabitants and a couple of tractors (you’ll find no cars around here) it is famous for its pickled capers which are grown on the nearby islet. You can buy a jar from friendly locals. In the recent years, Kaprije has started to develop as a tourist destination, but to the locals’ major disappointment, the newly built apartments remain half empty even during the peak summer season. The inhabitants of Kaprije pride themselves of having one of the best Dalmatian teams in “balote” (a game similar to bowling), which is the traditional form of their recreation and entertainment performed throughout the year. The village harbour has two piers with some 20 moorings and several tens of new buoys. On prior reservation, it is highly recommended to visit the Bilo Jaje tavern or Kod Kate, as it is commonly called by the always cheerful locals (tel. 00 385 915 745 354). In a typical minimalist Dalmatian ambient of three or four tables, Mrs. Kata will make you a fantastic red scorpion fish stew, octopus or lamb “under sač” (cooked in a pan covered by embers) or surprise you with always innovative seasonal specialities made of fresh fish. Her tavern is frequented by locals who bring a guitar and sing traditional Dalmatian “klapa” songs. They are often joined by random guests and the party doesn’t end until dawn. The second day includes a longer sailing trip to the island of Vis and the neighbouring islet of Biševo (40 Nm) with its Salbunara bay, where you can make a stop for a swim and an afternoon lunch. Since afterwards, you will probably be catching the last hours of the day, you can move to a safer anchorage in the neighbouring bay of Porat, where you can drop anchor in the turquoise water over fine sandy bottom at the depth of approx. 5 m. Make sure to fix the stern line to the shore. A short hike to Vela Gora (Stražica), the highest hill on Biševo is warmly recommended. On your way back stop at one of the two taverns standing on the edge of the sea and enjoy the magnificent view of your boat at sunset. Leaving Porat, sail around Biševo to the famous Modra Špilja (5 Nm). The best time to visit the 6 m high and 35 m long “blue cavern” is between 10 a.m. and 12 p.m., when the game of sun rays and water conjures up a unique spectrum of blue colours. During the peak summer season, there is usually a huge crowd in front of the narrow entrance, so be prepared to push your way in. Entrance fee is approx. 4 € / person. If you’re running out of provisions, continue towards one of the most famous fishing towns in the Adriatic, Komiža on the island of Vis (5 Nm), where you can moor the boat at the waterfront protected by a jetty, have a cup of coffee and do the necessary shopping. If you have time and an empty stomach, you have to taste the traditional Komiža or Vis cake at the local tavern Bako (tel. 00385 21 713 742). Then continue your trip with the early afternoon maestral to the south coast of Vis, which is slightly more rugged and less steep than the north coast. If you feel like having a swim, there is no better place to do so than in the Stončica bay (8 Nm), which is most often featured on postcards and front covers of brochures about Vis. The next stop is the island of Budikovac (5 Nm), famous as the island with the most beautiful lagoon in the Adriatic, where you can also treat yourself to an afternoon swim or lunch. If you want to make an overnight stay, you can do so in the bay of Rukavac. There you will find one of the best restaurants on Vis, the Dalmatino tavern (tel. 00 385 217 14 194). You can moor at their pier or anchor slightly off shore. Leaving Vis, set sail north-east, towards the Pakleni otoci islands (10 Nm), where you can indulge in an afternoon swim in one of the bays on the south-west side of the islands. The Stipanska bay on Marinkovac, located in the channel between Marinkovac and Planikovac, is most popular with navigators, while the Vinogradišče bay on Sveti Klement can often get over-crowded by tourists coming from Hvar, especially during the peak summer period. Those who would like to enjoy some peace and quiet may prefer to anchor in the bay of Soline hidden behind the islet of Dobri on the south side of Sveti Klement. Given that the picturesque bays lie just a few miles apart from each other, you should have no problem finding one to your own taste. Just off Pakleni otoci are the island and city of Hvar. The city itself is the hottest and most visited tourist destination in the Adriatic. The island’s rich history, which dates back to the Greeks, who controlled it in the 4th century BC, and continues with the Illirians, Romans, Slavs, as well as Venice and Genoa in the 13th and 14th centuries, has left a unique and charming imprint on the city, where the ancient meets the modern. In short, the city of Hvar is well worth the visit. The best and perhaps the only time to do so is in the early afternoon, when the city waterfront briefly empties out before the arrival of afternoon yachts. One of the major hotspots in the city is most definitely the famous bar Dioniz, which turns into a loud disco at night. During the summer season, you will often meet Croatia’s rich and famous as well as Hollywood stars parking their mega yachts at the waterfront reserved especially for them. The port does not provide a safe anchorage during the prevalence of strong winds from any quadrant, as the gusts may pick up heavily in the area, while the south and west winds may also cause high waves. The port can really get over-crowded, causing anchors to be entangled, and sailboats often crash into one another when rocked by passing tourist boats. Leaving Hvar, turn to the Pelegrin cape (6 Nm), which is the north-westernmost point of the island. Continue to the west cape of Šolta, towards the Maslinica bay (15 Nm), where you can anchor off the settlement with the same name, which is also the only settlement on the west coast of the island. The well protected bay surrounded by a thick pine grove has a port with a number of moorings, as well as electricity and water connections. Anchoring is possible at the depth of 8 m at the mouth of the bay. Just make sure you also fix the stern line to the shore. During the prevalence of exceptionally strong gusts of west winds, it is safer to anchor in the Šešula bay just a mile or so to the south. In the village you can do your morning shopping, sit in one of local bars and check the weather forecast in the internet cafe. The morning burin will take you north-west to the attractive Krknjaš bay (4 Nm) on the south-east side of Drvenik Veli, where you can anchor in crystal turquoise water and have an afternoon lunch. Then continue north-west, passing the Ploče cape, which is also called mid-point of the Adriatic Sea by navigators, as it marks the boundary between the north and south Adriatic. The cape also stands as the meteorological boundary with prevailing south winds to its south and northerly bora to its north. 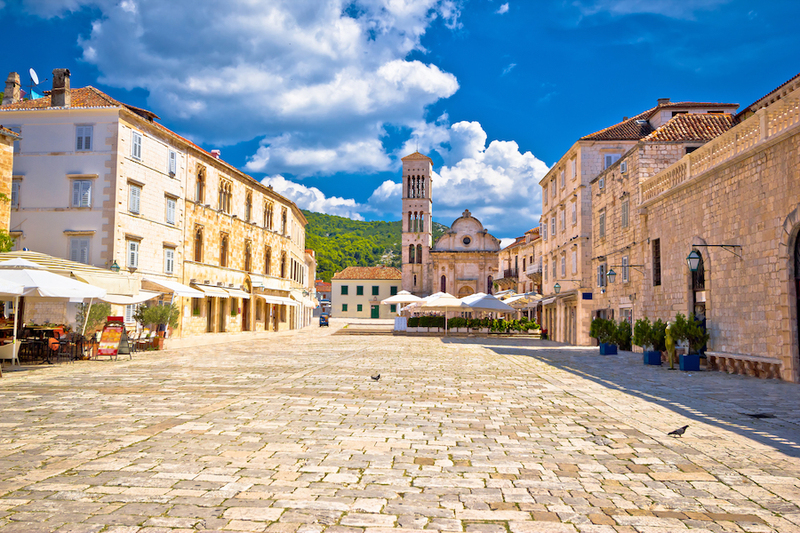 The afternoon maestral will take you to the idyllic town of Primošten (18 Nm). If you’re early enough, you can get a mooring with electricity, water and bathrooms at the town’s waterfront protected by a jetty. Otherwise you can tie the boat to one of many buoys in the bay. 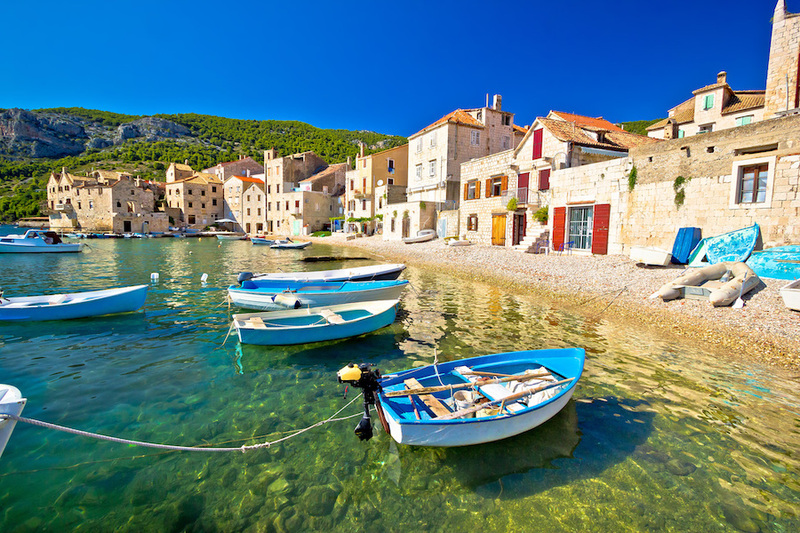 Primošten is a bubbly and picturesque town that attracts many tourists. It once stood on an islet close to the mainland and its name is associated with the construction of a causeway 150 years ago that connected the islet to the mainland (Cro. : primostiti – to span). The old town centre was built in the 16th century and protected by walls from Turkish invasions. The tiny peninsula consisting of one single settlement offers many restaurants, cafes, stores, souvenir shops, internet cafes and night clubs. Also recommended is a visit to the cemetery at the top of the peninsula, which is just a few minutes’ walk away from the marina and opens a spectacular view over the Kornati and Šibenik archipelagos. Just below the cemetery you will find the Gardin tavern (tel. 00 385 22 57 05 22), which specialises in the so-called Dalmatian fast food ranging from fried picarel, smelt, anchovies, squid, home-made cheese, prosciutto, and local wine (Babič). Those who seek a real decadent treat for your taste buds may find the right place at the Šarićevi dvori located four kilometres into the hinterland. This Dalmatian-style restaurant serves fish stew in a pot, meats and vegetables under sač, home-made cheeses, prosciutto and exclusively home-made wines. The owner Zoran (tel. 00 385 981 743 334) picks you up in the marina and drives you back again. Primošten has the biggest disco in the Adriatic (Aurora) located just a few hundred meters above the town. During the high season, the town square hosts a variety of events, concerts and other happenings. In the morning you can buy fresh fish from local fishermen on the other end of the bay. Sailing north, the route takes you past the island of Zlarin, where you can anchor and have a dip in the gorgeous Magarna bay on the south-east end. Leave Zlarin, the birth place of the inventor of the world-famous Maglite flashlight, behind on your left and enter the busy channel of Sv. Ante, which will lead you to Šibenik (12 Nm). There you can fill the reservoir at the waterfront and continue up the canal, which is also the mouth of the Krka river, to the Prokljan lake. Passage through the attractive river canyon, which is also the largest mussel farm in the Adriatic, is allowed only to sailboats with masts not higher than 27 m, as the route passes under two bridges. The maximum speed allowed is 5 Kt. You will reach the National Park Skradin (10 Nm) in the afternoon. This will be your last stop for the day. Mooring at the town’s waterfront or the ACI Marina gives you enough time to visit the old town centre, whose rich history dates back to 360 BC. Every 30 minutes there is an organised boat tour to the National Park Krka, which we recommend you to take the next day. Entrance tickets are available at about 12 €. Another feature of Skradin that navigators may find particularly interesting is the mixing of salt and fresh water. You can taste the saltiness of the river, which completely disappears in the upper part of the stream. Carnivorous members of the crew will have an unforgettable dining experience at the More tavern (tel. 00 385 919 281 032). The owner Andrija, no doubt, makes the best cured meats in this part of Dalmatia. Seafood lovers may find the food of their choice at the Zlatne školjke tavern (tel. 00 385 22 77 10 22), where they will be served mouth-watering river eel stew, as well as mussels and clams in 1001 ways, or at the Bonaca tavern (tel. 00 385 22 771 444) located just above the marina. After visiting the Krka national park, return downstream in the early afternoon, pass the Sv. Ante channel and turn to the Tijaščica bay on the islet of Tijat (13 Nm), where you can anchor for lunch and a swim. Then continue towards the north-west part of Murter and moor in a bay on the south side of the islet of Žminjak (12 Nm). Most of you may prefer to enjoy the last night on Murter, which offers a great deal of fun, gastronomic delights and other pleasures. We warmly recommend you to drop by Milenko Pleslić, a businessman and the owner of a typical Dalmatian restaurant with its own floating platform and several buoys. Water depth in the bay spans 3–5 m. Anchorage is protected from all kinds of winds, expect those from the third quadrant. The Pleslić family will pamper you with a delicious dinner in an exceptional atmosphere of their stone-built tavern with a view of the Kornati islands. The menu includes lamb, fresh fish and home-made wine. Those who plan to spend the night on the touristy Murter, carefully sail by Žminjak and between the two islets to Marina Hramina (2 Nm), as water depth does not exceed 3 m. Hramina lies just a few hundred meters from the town’s centre. The best place to eat on Murter is the Tic Tac tavern (tel. 00 385 22 43 53 04), which has an excellent reputation for its creative cuisine and a unique variety of typical local dishes. After an early rising, sail to the south of Pašman (7 Nm), enjoy the very last view of the Kornati islands, stop at the gas station to refill the reservoir at the ferry pier in Biograd (2 Nm) and collect the security deposit in the charter base.